President Uhuru Kenyatta embraces Chama Cha Mashinani leader Isaac Rutto at the start of Jubilee’s campaign rally at Kapkatet grounds in Kericho today. Former Bomet Governor Isaac Rutto has joined President Uhuru Kenyatta and DP William Ruto for the Kapkatet rally. 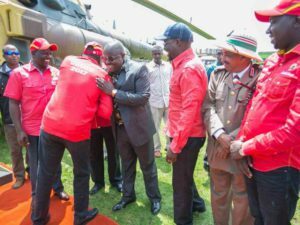 Rutto was among leaders who welcomed Uhuru and William Ruto after they landed in the area on Friday. Former Kuresoi South MP Zakayo Cheruiyot Emurua Dikirr MP Johana Ng’eno and Narok’s Patrick Ole Ntutu joined him. Kericho Governor Paul Chepkwony and Senator Aaron Cheruiyot are among leaders attending the rally. Rutto’s move signaled he is on his way out of Raila Odinga’s National Super Alliance team which he joined as the fifth principal. Raila Musalia Mudavadi (ANC) Kalonzo Musyoka (Wiper) and Moses Wetang’ula (Ford Kenya) joined forces ahead of the August 8 general election. Former Meru Governor Peter is their newest members. He even attended the swearing-in of the new governor and promised to work hand in hand with her to develop the county. The Chama Cha Mashinani leader will now campaign for Jubilee Party ahead of the October 17 election. He has been conspicuously missing in NASA rallies since he was defeated. During a press briefing last week, NASA chief campaigner Mudavadi insisted Rutto was still in NASA. IEBC is set to hold fresh election after the Supreme Court declared Uhuru’s victory null and void. This followed a petition by Raila citing massive irregularities in the conduct of last month’s poll.